The sidebar is located in the area below your left navigation. Adding sidebar content can be done a few different ways. 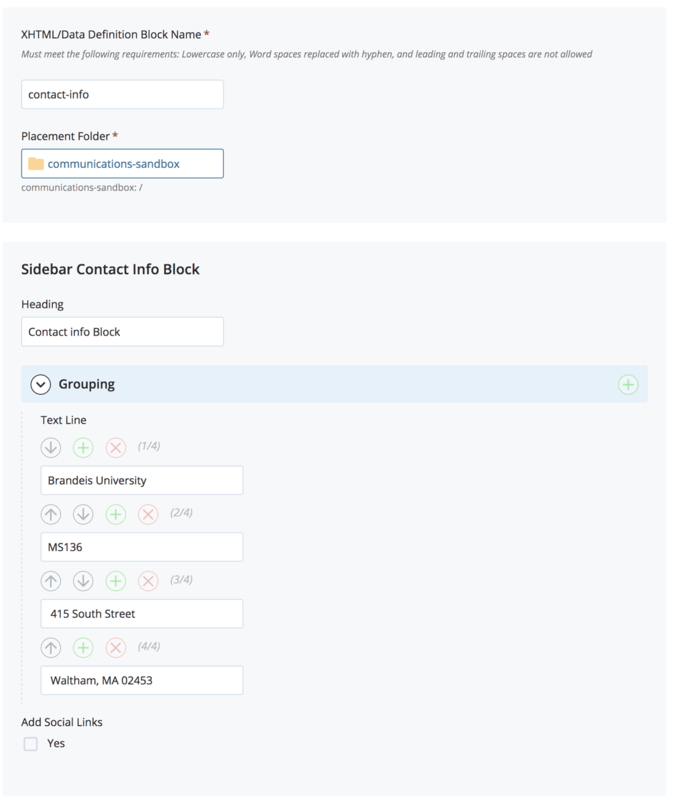 The Sidebar Contact Info Block is used to display contact information with optional social media links. To create a new block, click + Add Content from the top black menu bar, then select Sidebar Contact Info Block. XHTML/Data Definition Block Name (previously System Name): contact-info is the default system name. We recommend leaving this name unless you have multiple contact info blocks that need differentiation. Heading: Enter a Headline. Use Initial Caps. Examples: Department of Communications or Contact Us. Use the green plus icon ( + ) to add more Text Lines. Example: For the following text, you would need four Text Lines. Once you add a second Text Line field, you will see options to move content (using the up/down arrows) or delete content using the red delete ( x ) icon. Click the three dots ("kabob" menu) next to Preview Draft at the top right. Then, click Check Content & Submit to save your page. The spelling/link checker window will appear. Once you have reviewed and corrected any issues, click the blue check mark to finish submitting your block. Your block is not saved until you click this checkmark, even if you have no spelling or link errors. Note: You will not see a preview of your formatted block. Add your block to a page to view it. 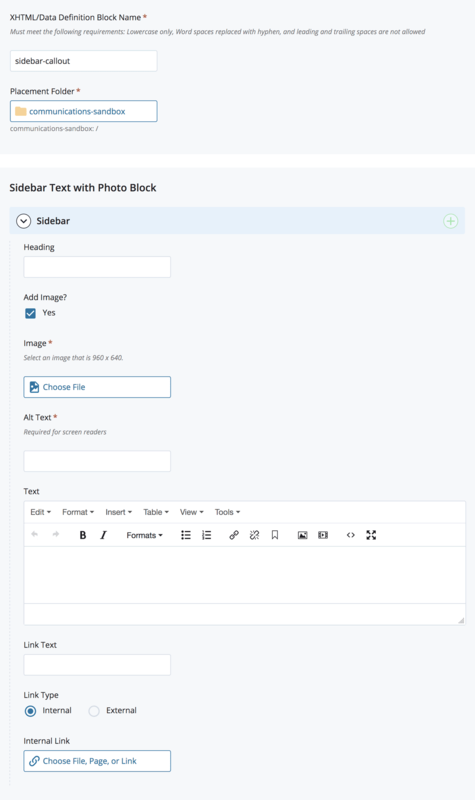 The Sidebar Text with Photo Block is a flexible content area with a headline, purple horizontal Swiss bar and text (can include formatted text like links). 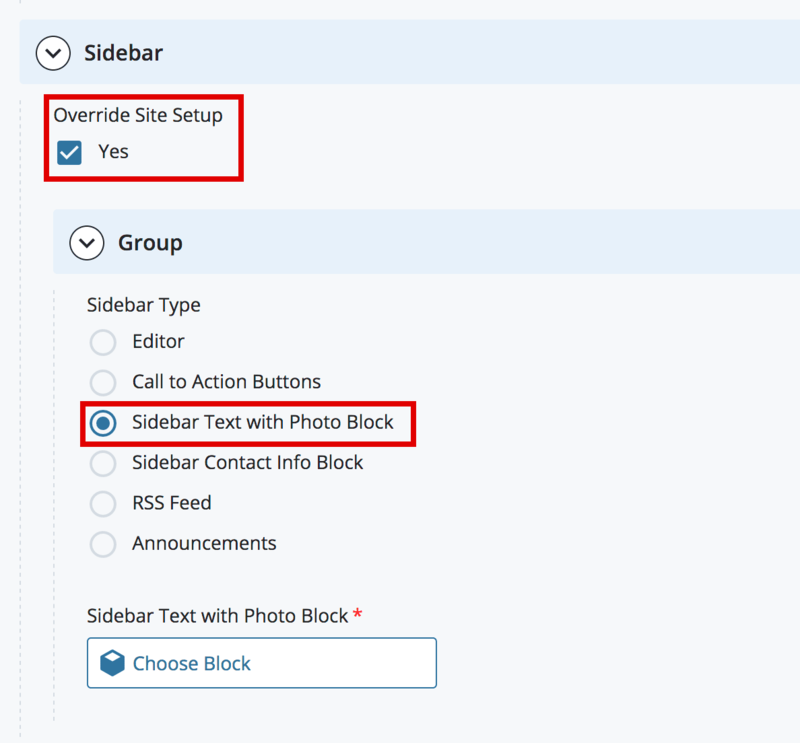 To create a new block, click + Add Content from the top black menu bar, then select Sidebar Text with Photo Block. XHTML/Data Definition Block Name (previously "System Name"): sidebar-callout is the default block name. You may keep this name or edit it. If you edit it, please only use lowercase letters and separate words with hyphens. Heading: Add your Headline. Example: Did You Know? Add Image: If you want an image to appear, check this box. Your image dimensions must be 960 px x 640 px. If you add an image, you must add Alt Text to describe your image. This text will be read to people who cannot see the image. Text: Enter and format your text. Be sure the text in the Editor is formatted as Paragraph text. Link Text: This creates a formatted text link (in ALL CAPS) below the text you enter above. 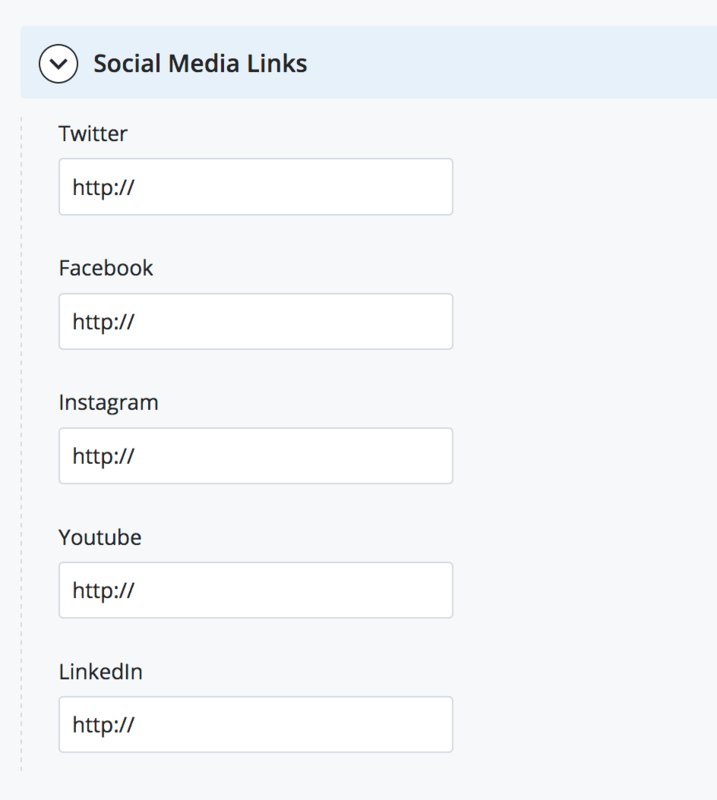 If you are using an Internal Link, click Choose File, Page, or Link. In the Chooser Panel, you can select a recent internal page, or browse for an internal page. If you are using an External Link, enter the URL, including the http://. Click the three dots ("kabob" menu) next to Preview Draft at the top right. Then, click Check Content & Submit to save your page. The spelling/link checker window will appear. Once you have reviewed and corrected any issues, click the blue check mark to finish submitting your page. Your page is not saved until you click this checkmark, even if you have no spelling or link errors. The RSS Feed Block displays titles and links from an RSS feed, such as a blog. To create a new RSS Feed Block, email cmshelp@brandeis.edu and a member of the Web Team will assist you. You can set up sidebar content so that all pages on your site have the same content, or you can have different content on each page. To set up all pages with the same content, you will follow the steps for the site-setup block for your site. 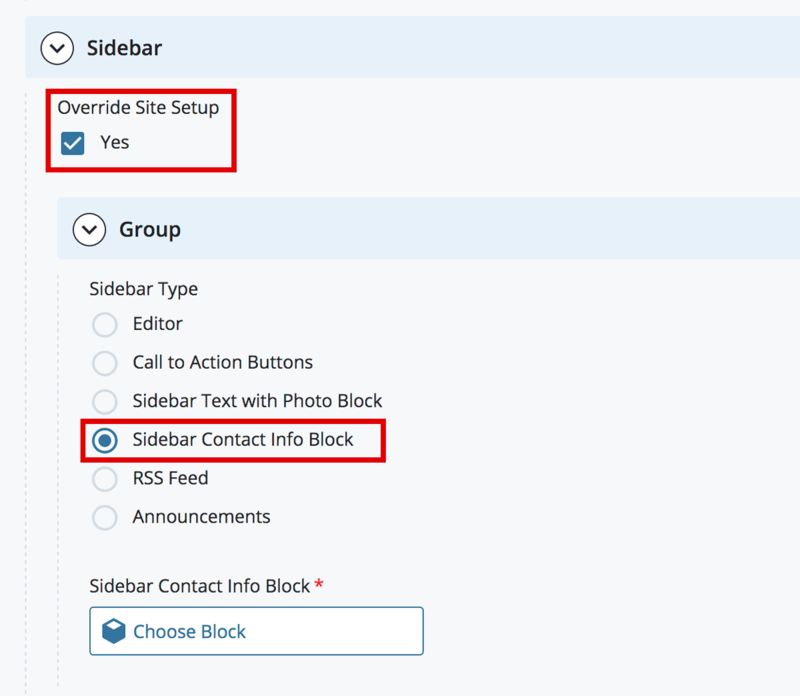 To add or edit sidebar content to a single page, follow the steps below. Scroll down to the Sidebar section. Check the box next to Override Site Setup. Click the > Group button to expand the content. 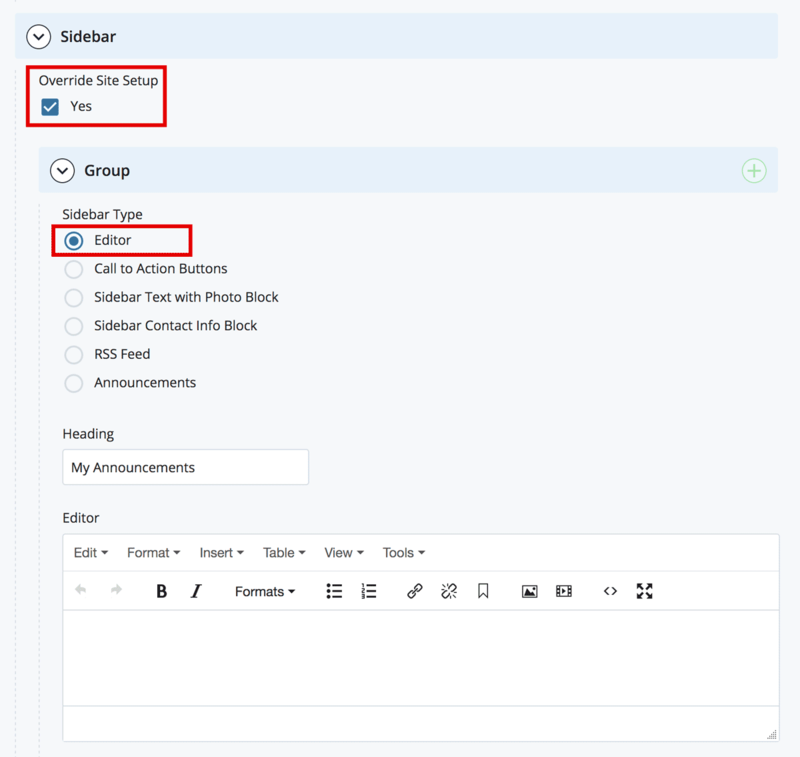 You will see six radio buttons with types of sidebar content: Editor, Call to Action Buttons, Sidebar Text with Photo Block, Sidebar Contact Info Block, RSS Feed and Announcement. Enter and format your content directly in the WYSIWYG editor. To add another Sidebar type, click the green plus icon ( + ) in the top right part of the screen. Once you add a second Sidebar type, you will see options to move content (using the up/down arrows) or delete content using the red delete ( x ) icon. Create clickable button(s). Buttons will be automatically formatted with black text in ALL CAPS. Buttons will be white with a black border. Link Type: Internal/External Link: If you are using an Internal Link, click Choose File, Page, or Link. In the Chooser Panel, you can select a recent internal page, or browse for an internal page. If you are using an External Link, enter the URL, including the http://. Note: If you do not enter a URL, your button will appear but it will not be clickable. To add a new Call to Action button, click the green plus icon (+) in the light blue bar to the right of the words Call to Action Button (not in the blue bar which says Group). 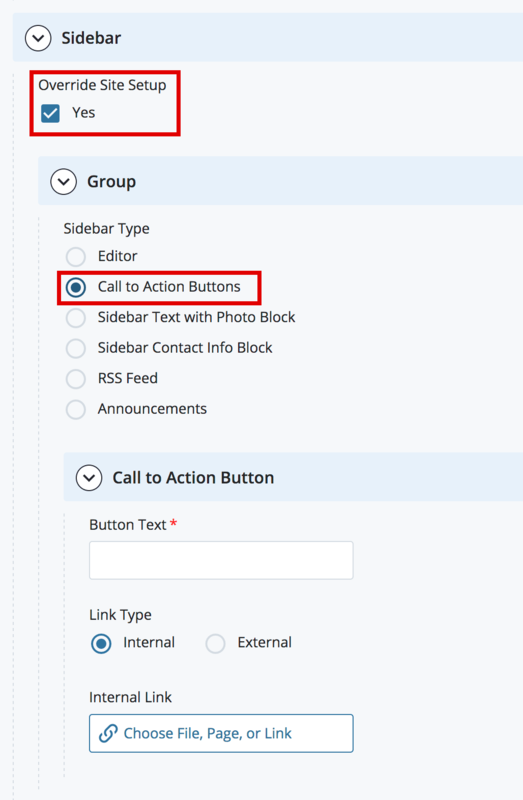 To add a new sidebar item, click the green plus icon ( + ) in the light blue bar to the right of the words Group (not in the blue bar which says Call to Action Button). Search or browse for a Sidebar Text with Photo Block you have already created. To add a new sidebar item, click the green plus icon ( + ) in the light blue bar to the right of the words Group. Search or browse for a Sidebar Contact Info Block you have already created. Search or browse for a RSS Feed block that the Web Team has created for you. Heading: Add your Headline. Example: "Economics Department Blog"
Max News to Display: Enter a number of titles you want to appear in the sidebar. We recommend 3 to 5. The Announcement sidebar content type will display the titles of indexed Announcements from the main Announcements Content Type. Heading: Add your Headline. Example: "Recent Job Postings"
Announcement Page: Browse to the folder on your site where your Announcements Content Types are located. Select any asset in the folder. Link Type: This creates a formatted text link (in ALL CAPS) below the text you enter above. 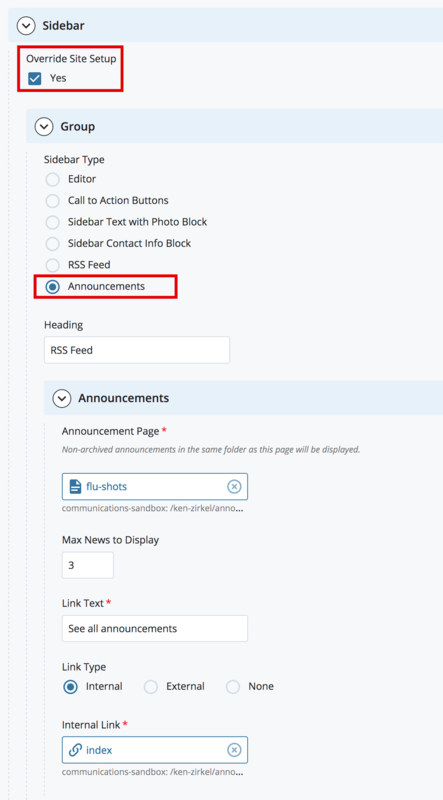 To have the link go to your main Announcements page, select Internal Link and the Chooser Panel will open to allow you to Search or Browse for the index page in your Announcements folder. 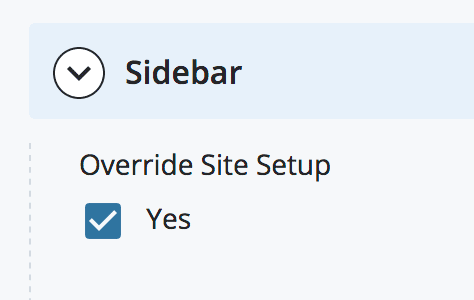 This sidebar content is being displayed using the Editor radio button. You can find a list of every topic in the CMS Guide in the A-Z Help List.